"Now known as the William J. Lee Memorial Town Hall, the Lafayette Building was built in the early 1870's after townspeople agreed that a new high school was needed to replace the existing one on Crescent Street. The site selected, on the northwest corner of Lafayette and Common Streets, was the former site of the Parson Prentice house, built in 1740, the third parsonage in the First Parish. 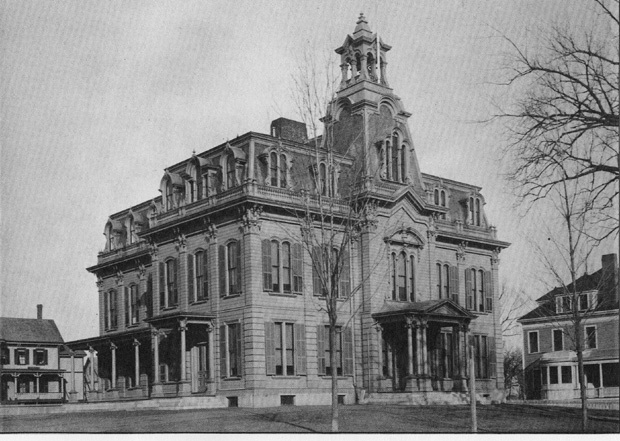 A 'fine, commodious high school edifice' was built and dedicated on October 10, 1872 'with becoming dignity and general approval. The building was conceded to be the best in the state.' In 1913, the Town of Wakefield voted to buy the estate of Cyrus Wakefield on Main Street for the new high school which was dedicated in 1921 and opened in 1923. All eighth grade students, with the exception of the Greenwood School, were transferred to the Lafayette School in 1923. The school was closed in 1931 and the remaining students were moved to the new high school where they attended the afternoon session. The building was remodeled in the late 1930's to house town officials and veteran's organizations. The Lafayette Building became the official Town Hall in 1962." -- Text from calendar by Jayne M. D'Onofrio. “Wakefield High School, December 25, 1897,” NOBLE Digital Heritage, accessed April 22, 2019, https://digitalheritage.noblenet.org/noble/items/show/7137.